Finding Sysadmins on a SQL Instance. In this blog we shall see, how to find the users who have sysadmin rights on your SQL Server. It is very important to know who are the users who have sysadmin rights, because sysadmin is the highest level of security permission on a SQL Server. A user having this permission can do everything on the SQL Instance, such as Create / Delete / Disable other users including other sysadmins. 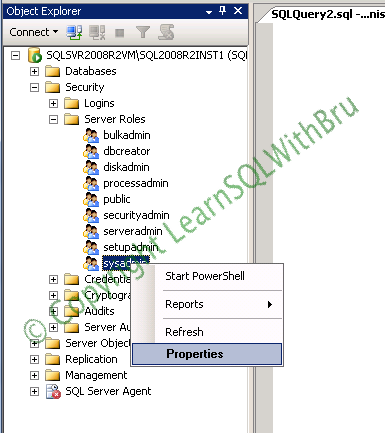 Create / Drop databases, Start / Stop SQL Server and the list can go on..
We can query the catalog view syslogins and find those rows which have a value of 1 in sysadmin column. 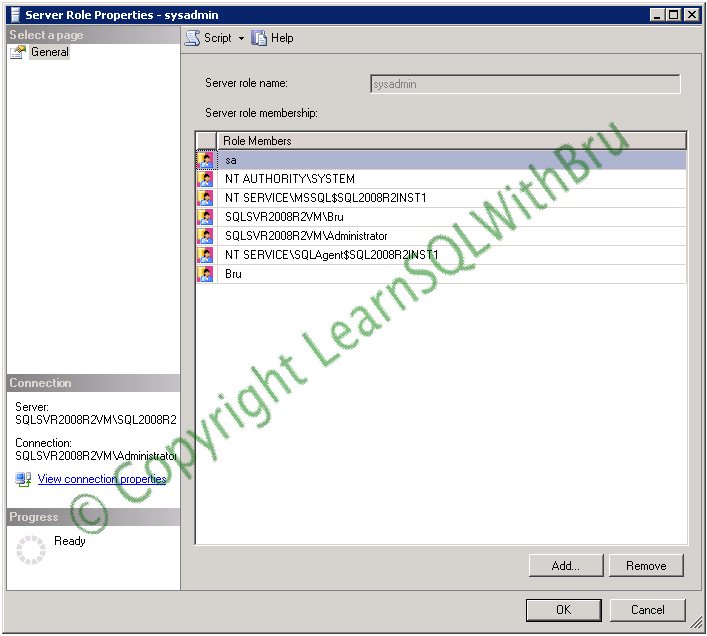 The query used below filters to find those users who have been granted access to the SQL Server. The result when run on one of my personal SQL Server looks as shown below.. I selected an additional column isntname, in order to see what type of login is that user. 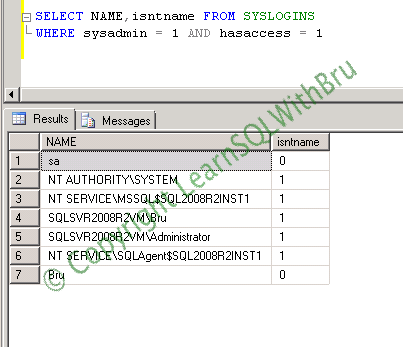 When isntname = 0, it indicates the login is a SQL login and 1 indicates a windows based login. You can also find out using Management Studio. When connected to the SQL Server, expand Security node, and expand Server Roles. From the list of Server Roles right click sysadmin and choose Properties from the popup Menu item. You will see the properties dialog box for sysadmin role as shown below..